I'm not a big fan of wireless mice. The absence of a cord is moderately convenient, especially for use with a notebook in mobile mode, eliminating cord tangles and the necessity of plugging and unplugging the mouse cord, but I fail to see much advantage in a wireless mouse for desktop use, with its requirement for periodic battery changes or recharging, the hassle of Bluetooth device pairing, and the minor annoyance of wake-up lag. Nevertheless, wireless mice are becoming more and more popular, so perhaps I'm in a minority. 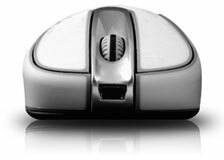 The RadTech BT600 Bluetooth Wireless 5-Button + Scrolling Mouse is a full-size rodent that offers 5-button control along with 800 dpi optical tracking, rechargeable NiMH batteries, and in-mouse fast-charging via USB cable. Simply attach the USB charging cable to your computer, and the included NiMH batteries begin charging while you continue working. The BT600's battery compartment is accessed through a removable cover panel on the bottom that releases by using a coin, or, as I found, just with finger pressure. The two rechargeable AA NiMH cells slid in easily, and it only took a few seconds. You can find more information online. 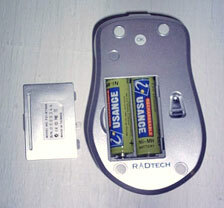 Note: RadTech warns to only use rechargeable alkaline or NiMH cells in these mice, and only to connect the USB charge cable with NiMH cells installed in the mice (i.e. : don't try to charge regular alkaline batteries using the USB cable). With this rechargeable mouse, you never need to get stranded with dead batteries - just connect the included USB charging cable and let the batteries charge while you continue working with the equivalent of a wired mouse. The scroll wheel doubles as a charge/connection status indicator (blue/purple while connecting, red while charging, and green when fully charged). The batteries charge very quickly - taking under an hour for the indicator to turn green. The BT600 uses a cable with a standard mini USB connector of the sort used to connect digital cameras to computers or printers. The BT600 automatically enters sleep mode after 2-3 minutes of inactivity; click a button or move the mouse while in sleep mode, and the connection is seamlessly restored in seconds. An easily accessible power switch (located on the the top of the BT600) allows the device to be manually powered down for extended periods of nonuse and prevents accidental power up during transport. Connecting the mouse is simple - no drivers are needed for Mac or PC. OS X's Set Up Bluetooth routine (select from the Bluetooth menu) found the BT600 quickly and with no hassle. To activate the mouse connection, make sure Bluetooth is active on your computer. In OS X, check the "Discoverable" check box in the Bluetooth preferences panel and also "Show Bluetooth Status in the Menu Bar". On the mouse itself, make sure batteries are installed, and turn the power switch on. You may or may not have to press the pairing button (on the bottom near the optical sensor). The scroll wheel should glow blue to indicate that the mouse is in "Discoverable" mode. From the Bluetooth menu, select "Set Up Bluetooth Device" and follow the instructions. When asked for "Device Type", select "Mouse". If you're using the mouse in conjunction with a Bluetooth keyboard, make sure to switch the keyboard on first and then the mouse (after the mouse has been paired). If asked for a pairing code, enter 0000 (four zeros). Note: don't press press the pairing button once the mouse has been paired. If pressed, connection will be lost and the pairing process will need to be repeated. The BT600's buttons 4 and 5 are positioned near the right thumb for right-handed users, and all buttons are fully application assignable with no additional software. All the mouse buttons are fully application assignable with no additional software, but you can install RadTech's free RadMouse configuration driver (see below) and take even greater control of your digital domain. The BT600's main buttons are quite light and comfortable to operate, although they could have a more robust feel to them. They're basically just plastic flaps that bend when you click, toggling a microswitch beneath. I don't think they would be especially prone to failure, but I'm not crazy about the feel. The scrollwheel works well, although it is detented, while my personal preference is for a smooth, rotary action. The scrollwheel also acts as the third button and is much stiffer than I prefer - but that's usual with scrollwheel click buttons. I was not impressed with the side-mounted fourth and fifth buttons. The back one was way too stiff, and the front one even stiffer. Not a biggie for me, as I rarely use more than two mouse buttons routinely. 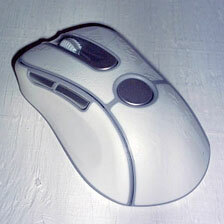 Otherwise this is a quite comfortable, full-size mouse with scallop-contoured sides that the hand cups naturally. All tactile contact surfaces are coated with a rubbery "traction" cladding - smooth in the side-scallops and textured on top. I'm a bit apprehensive about how grubby this off-white material will become in use, but I expect it can be cleaned successfully. Styling-wise, this one doesn't especially grab me, but the BT600 works very well with smooth, light, and precise tracking. Note that there is a slight asymmetry in it's contours, which are oriented toward right-handed users. The BT600 is a good, solid choice in a full-sized Bluetooth mouse. If wireless mice appeal and your Mac supports Bluetooth, it's well worth considering. 10 Meter free space range - control your computer from across the room! Take full control of your RadTech Bluetooth mouse with RadMouse - RadTech's Bluetooth HID Driver & System Pref. Map mouse buttons and scroll wheel to single or multiple keystrokes or actions, adjust cursor tracking and scrolling speed, acceleration curves and more. And all custom settings can be global, or application specific. Entire Low End Mac site copyright ©1997-2016 by Cobweb Publishing, Inc., unless otherwise noted. All rights reserved. Advice presented in good faith, but what works for one may not work for all. Please report errors to the webmaster. Access our RSS news feed at http://lowendmac.com/feed.xml. Email may be published at our discretion; email addresses will not be published without permission. If you prefer your message not be published, mark it "not for publication." Letters may be edited for length, context, and to match house style. Low End Mac is an independent publication and has not been authorized, sponsored, or otherwise approved by Apple Computer. Apple, the Apple logo, Macintosh, iBook, iMac, eMac, iPod, and PowerBook are registered trademarks of Apple Computer, Inc. Additional company and product names may be trademarks or registered trademarks and are hereby acknowledged.